When producing a movie, everything stems back to this box: IDEA. In the 1940s, these were the sources of ideas: “Play,” “Short Story or Novel,” “Newspaper Story or Current Event,” “Original Story,” “Magazine Article,” or “Historical Incident.” Way off on the left, however, there’s one additional source that’s not shown above: “Vice President in Charge of Production.” If you want something unoriginal done that isn’t in print or in the history books, go talk to the VP, he’ll get it done. 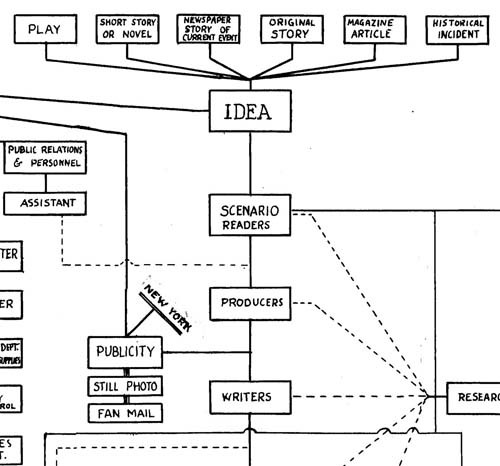 On another note: this particular flowchart is one of the few places the words “Restaurants,” “Mimeograph,” “Arsenal,” “Publicity,” and “Bits & Extras” fit together so well. From the 20th Century Fox flowcharts collection. This entry was posted on Friday, October 30th, 2009 at 1:40 pm	and is filed under Uncategorized. You can follow any responses to this entry through the RSS 2.0 feed. You can leave a response, or trackback from your own site. « A Warm Stove, 1930s.